Many people believe in Heaven, a paradise of unending peace, and Hell, a place of eternal damnation and torment, from where there is no escape. Others dismiss such conjecture as primitive idealism. A few know for a fact that at least one exists. Let us journey across the stars, to a world named Enigma. Once, it was a beautiful Earthlike planet, with pristine oceans and verdant forests teeming with life. Billions of humans lived here, in grand cities with towering skyscrapers and bustling economies. If you said that to the inhabitants now, they'd call you crazy. Enigma has been a dead world for centuries, its modern inhabitants know only death, decay, and radiation. Many years ago, a global thermonuclear war started, and ended six hours later. When the dust settled, 86% of the population had been vaporized in nuclear fire, and enough soot and ash had been thrown into the atmosphere to blot out the sun for thousands of years. The planet fell into a deep nuclear winter, as irradiated snow blanketed what were once steamy jungles. Over the next several years, mutated viral waves swept the globe, killing or crippling thousands who had survived the microsecond-lifespan stars blooming across their world. When it was all said and done, fewer than a quarter-million humans survived, having been forced underground into sewers and subways. Now, their descendants eke out a pitiful existence, with the few existing subterranean villages surviving off jury-rigged hydroponics and dwindling canned food, most of which is half-spoiled. In an effort to secure more supplies, various bands of scavengers venture outside into the irradiated wastes, braving toxic smog that will blister and corrode exposed skin in a matter of minutes. Multiple layers of clothing, thick coats, gas masks and taped sleeves are the typical uniform of the Enigman scavenger. They relentlessly scour charred craters and blasted ruins for food and supplies -- things that everybody else wants, and won't hesitate to kill for. Above ground, referred to as the Shattered Skies in reference to both the massive craters and chasms that pockmark its surface, and the common belief extending from fragmented religions that those who venture outside are setting foot in Heaven itself, they fight eachother like mad dogs, brutally murdering for dented, half-burnt cans of dog food, among toxin-choked ruins barely even recognizable as having been man-made. Yes, Hell does indeed exist, and it has a name: Enigma. 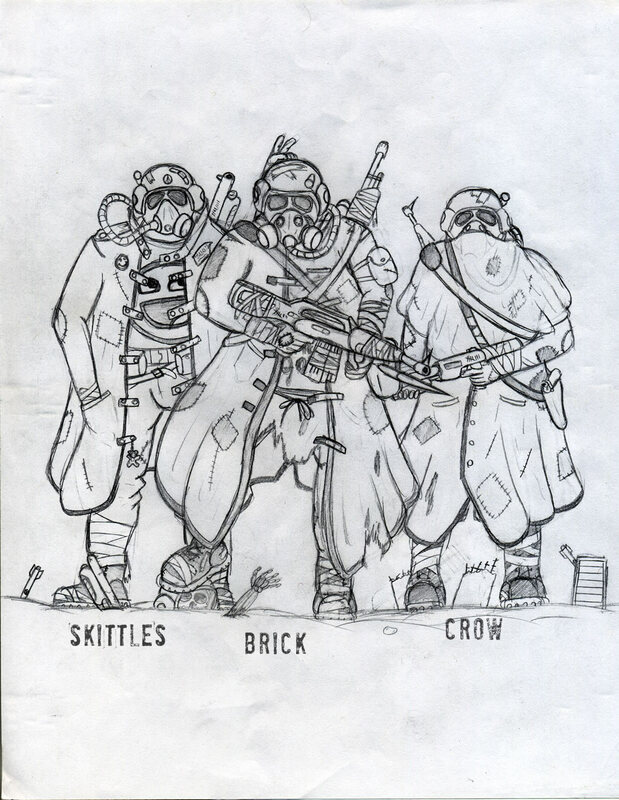 A trio of Scavengers operating out of the Ashen Falls Metro, the Three Blind Mice are the town's most prolific surface-goers, and are often heralded as 'the only thing keeping us alive down here'. Veterans of the Shattered Skies, the Three Blind Mice risk their lives not only to sustain their meager community -- it gets boring as hell in the tunnels. The group's uncompromising leader, Brick uses whatever means necessary to keep the other two in line, although oftentimes most of his negative attention is focused on Skittles. Brick has been known to use alternate methods to expending valuable ammunition -- such as hurling bricks at opponents, or engaging in a fist-fight. A heavy drinker, Brick revels in the stories about him that abound -- such as a popular rumor that he brings a Camel-Back filled with alcohol on his journeys to the Shattered Skies. Brick packs a 5.56mm assault rifle and a 7.62mm sniper rifle. Crow fills the role of planner and tactician. He rarely speaks, but when he does, it's usually to announce some borderline-suicide plan that almost invariably leads to a large cache of supplies or other such boon. Brick suspects him to be a bookworm, a rare archetype that, due to technology and extensive knowledge having brought about their current predicament, carries a certain stigma among commoners. His relationship with Skittles is tenuous at best. Crow carries a 5.56mm assault rifle, a 9mm semi-automatic pistol, and a 12-gauge pump-action shotgun. He often cloaks himself with a black shawl, draped over his shoulders and covering the bottom half of his gas mask. The youngest of the Three Blind Mice, Skittles is the group's comic relief. He often pulls (mostly) harmless pranks, or regales the group with grandiose stories. He is also a skilled tailor, having patched the group's clothing countless times. In addition to his role as morale officer and repairman, Skittles also serves as the group's scout. His nimble body enables him to fit through crevices too small for the others, and his innate knack for avoiding traps or dangerous terrain has saved the group time and again. Skittles and Crow have a history of arguing, mostly provoked by Skittles' pranks or sarcastic remarks. However, the two have saved eachother numerous times. Even when not venturing out to the surface, Skittles is rarely seen without his thick overcoat. Only he knows why; when questioned about it, he quickly dodges answering. Skittles carries a 12-gauge pump-action shotgun, and a .45 semi-automatic pistol. He is fond of smiley faces, often wearing a smiley pin and smiley face T-shirt. A small teddy bear keychain dangles from the bottom clasp of his coat.